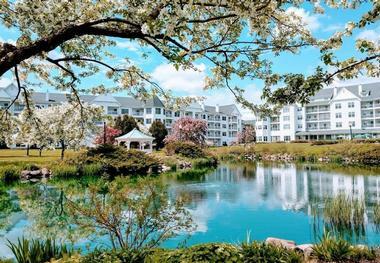 Wisconsin is home to many beautiful hotels, inns and lodges where you can spend your weekend relaxing with a view, going on romantic walks around a lakes, having spa treatments and tasting delicious cuisine. Our list includes an array of options in some of Wisconsin’s prettiest towns. Enjoy romantic amenities such as a fireplace in your room, gardens and historic architecture. Best Wisconsin destinations include Madison, Milwaukee, Bayfield and Green Bay. The Delafield Hotel is known for its sophisticated atmosphere with an old-world charm, and makes for an unforgettable vacation experience. The Four Diamond Hotel has thirty-eight luxury suites with 10-foot ceilings, Baker furniture and fine Italian cotton linens. The rooms also have Kohler spa bathrooms, flat screen TVs, and gorgeous oriental rugs. Guests are taken care of throughout their stay, and can take advantage of concierge services, service shuttles, and access to a fitness & wellness center. They also have the option of ordering in-room spa options, with services such as therapeutic and couples massages available. Andrew’s Bar & Restaurant has an enticing menu which includes lamb tenderloin, cheddar hush puppies, fennel-crusted red snapper, and delicious desserts of lemon curd and frozen lime parfait. Be sure to check for packages. 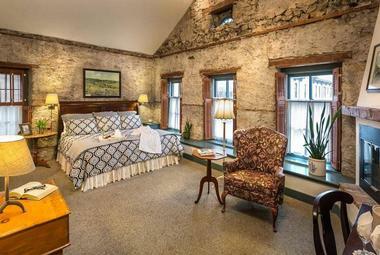 Old Rittenhouse Inn is a romantic weekend getaway with twenty stylish, elegant and inviting rooms with a fireplace. Downtown Bayfield is conveniently close, providing guests with shopping, eating, and sightseeing opportunities. Waterfront activities like boating and swimming are also available at nearby Lake Superior. Hearty two-course breakfasts are served every morning in Old Rittenhouse’s Restaurant, which also offers a three-course lunch and a five-course dinner, each of which is comprised of a variety of delicious entrees and tempting desserts. The restaurant also has vegetarian and gluten-free options. 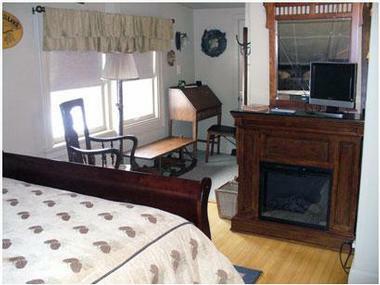 St. Croix River Inn Bed and Breakfast is dedicated to the comfort of its guests. The suites are the picture of refinement and comfort, and guests will enjoy relaxing by the fireplace or in front of the flat screen TV. Alternatively, you can find something to do in the entertainment center, which is full of movies, books, and games. If you feel like pampering yourself, book a relaxing massage in the comfort of your own room. Visit nearby museums, wineries, restaurants and theaters. For lunch and dinner on Fridays and Saturdays, the inn provides guests with several options from two enticing menus. Suites start at $150 per night. The Holiday Music Motel is a fun and affordable place to stay, offering live music at least once a week, ensuring you will have a good time. The motel has a fire pit and ample lawn space available for guests’ use. The rooms are well decorated and provide all the necessary comforts. You will be pleased to learn that the Holiday Music Hotel is located just a block away from a popular shopping and dining strip. In the morning, guests can have continental breakfast at the onsite diner, which has a cool, retro feel. The diner has a microwave, coffee pot, and toaster available for guests to use. Rooms start at $49. 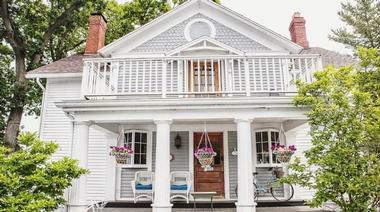 The Thorp House Inn and Cottages is a charming bed and breakfast listed on the National Register of Historic Places that offers a variety of lodging options. The house has five rooms with flat screen TVs and free wireless Internet. There are also six cottages, each of which has two bedrooms, a flat screen TV, a brick patio, and a Weber Charcoal grill. Guests are more than welcome to spend time in the public areas of the inn. They can relax on the front porch with a book or with other guests. There are several events that take place near Thorp House throughout the year, including the Fish Creek Winter Festival and the Plein Air Festival. For those staying in the main house, breakfast is served in the kitchen at the dining table. Breakfast includes juice, fresh fruit, muffins, homemade granola, hard-boiled eggs, and coffee or tea. Rooms start at $165. The Franklin Victorian Bed and Breakfast is an inviting getaway with four tastefully arranged rooms, all of which all are comfortable and provide the perfect space for you to relax during your stay. Each room is equipped with a mini refrigerator, a multi-port charging station, and a Smart TV that also includes Netflix and a DVD player. Guests can also enjoy complimentary wine. During their stay, guests can snack on homemade cookies while they play games and books provided by the bed and breakfast. There are also plenty of walking paths and bike trails. In the mornings, guests can pair their multi-course homemade breakfast with freshly brewed coffee, tea, or hot chocolate. Rooms start at $120 per night. The Washington House Inn has twenty-nine uniquely decorated rooms, each of which features a fireplace, whirlpool bathtub, flat screen TV, and high speed Internet. While there, guests can relax in the sauna or use the health club passes to work out at the gym. There are plenty of things to see and do in the area; guests can enjoy a thirty-two mile long paved biking and walking trail and an array of shopping, restaurants, museums, and spas. The inn serves a delightful homemade breakfast in the mornings from 7:00 to 10:00 in the gathering room. They accommodate all dietary needs, ensuring you will be perfectly comfortable throughout your stay. Rooms start at $149 per night. Be sure to check for weekend getaway packages & deals. Lazy Cloud is ideal for couples looking for a secluded getaway full of fun adventures in Lake Geneva. 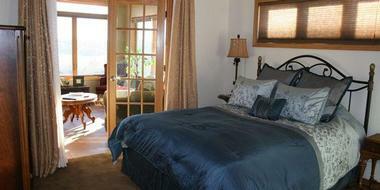 There are nine rooms at the inn, offering a rustic cottage feel and warm atmosphere. The rooms provide a dining area for two, a fireplace, a couch or loveseat, and all the other amenities you would expect. The inn also provides wine or champagne, candles, chocolates, and scented bubble bath, making your stay incredibly luxurious. Guests can also admire the beautiful pond and gazebo located outside in the small garden area. Upon arrival, guests will find a complete continental breakfast in their suite, meaning they can have breakfast in bed at any time. The breakfast includes muffins, Danish pastries, and orange juice, while coffee service is available in the rooms. Rooms start at $139 per night. The White Gull Inn is an inviting bed and breakfast located in a fascinating and beautiful historic building. There are thirteen rooms distributed amongst three different buildings, two cottages, and two houses, all of which are available for rent. All the accommodations have televisions, air conditioning, and private bathrooms, and hot coffee is delivered to the rooms every morning. Take in the alluring landscapes from the beautiful outdoor patio area or spend some time relaxing or visiting in one of the common areas. The restaurant serves breakfast, lunch, and dinner, and breakfast is included in every overnight stay. The breakfast menu consists of eggs benedict, French toast, cherry pancakes, corned beef hash, and fresh eggs with bacon, sausage, or ham. Rooms start at $170 per night. Hidden Serenity Bed and Breakfast somehow manages to offer its guests both seclusion and the allure of an incredibly convenient location. 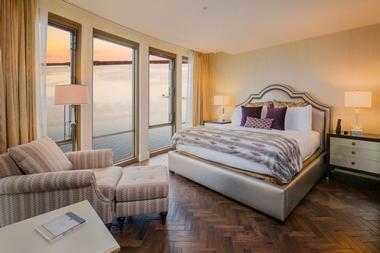 The four guest rooms feature several amenities, and they are all spacious and elegantly decorated. The onsite mini-spa offers massages for singles or couples, including Swedish and therapeutic massages. A billiard room, a tennis court, and private walking trails are all available for guests to use, and they can also partake in bird watching. A full, homemade breakfast is served in the dining room each morning, and it includes items such as pancakes with lemon sauce and cheesy mushroom quiche. Rooms start at $149 per night. Springdale Inn is located on ninety-seven scenic acres and offers five rooms and suites, each of which has attached private baths, televisions with a movie channel, and access to Wi-Fi. Guests will enjoy spending time in the Recreation Room, which has a Ping-Pong table as well as an indoor pool. The country roads also provide a nice place to go biking or take a walk or run. The inn offers several entertaining workshops, including workshops on yoga, watercolor painting, crafting, and Green Living. Don’t miss breakfast, which includes items such as double chocolate muffins, fresh fruit, coffee, juice, buckwheat pancakes, and tea. The kitchen caters to special dietary needs as well, including gluten-free, vegan, and diabetic friendly options. Rooms start at $120 per night. 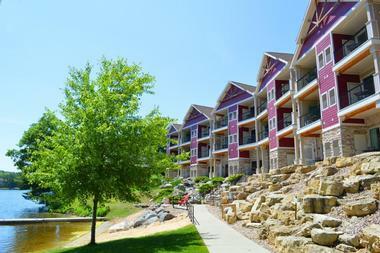 More ideas: Wisconsin weekend getaways for families. 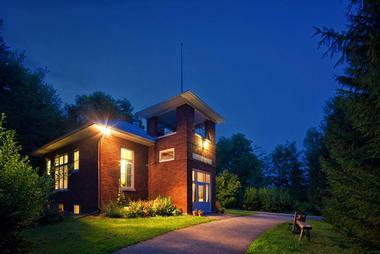 Wilson Schoolhouse Inn is a unique destination with an open concept. There are two bedrooms with private baths and two sleeper sofas, and can accommodate up to eight guests. 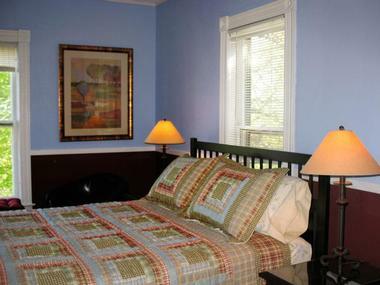 One of the guest rooms has a queen bed while the other has two twin beds, with a futon and crib available for children. Only one group at a time can rent the Schoolhouse, meaning that you can surround yourself with whomever you choose on vacation. Staying at the Schoolhouse gives you full access to a fully equipped kitchen, laundry facilities, and a large living room with a TV and cable. Guests are welcome to use the picnic table and grill that are located in the garden, and they can bring their own food and make whatever they want in the gourmet kitchen. There are several dining options located in town. Rooms start at $140 per night. Reynolds House Bed and Breakfast is an inviting country-style establishment conveniently located a short walk from downtown. The five spacious guest rooms are charming and inviting, and they feature modern amenities like satellite TV and high speed Internet. Some rooms also have whirlpool tubs or gas fireplaces. The front parlor is a cozy place to read and relax, or you can experiment on the 1906 pump organ. The second floor landing has nice seating arrangements, and is stocked with books, magazines, games, and brochures for local attractions. Start your morning with a delicious gourmet breakfast. Guests will love the fresh fruit, bacon, egg dishes, and pastries. Rooms start at $95 per night. 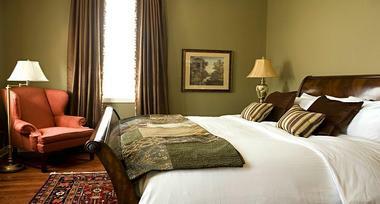 The Black Walnut Guest House is roomy and guests will feel right at home in their comfortable rooms. Each room has a private bath, a television with cable and a DVD player, a refrigerator, and high speed Internet. Couples will definitely want to take advantage of a special massage package where the two will enjoy a relaxing massage in candlelight with chocolates and a bottle of champagne. Other packages feature attractions around town, such as dinner and a show, so be sure to look into those options during your stay. Breakfast is delicious, and it’s brought right to your door at the time of your choosing. The menu includes hot and cold cereal, yogurt, granola, fresh fruit, muffins, coffee, and tea. Rooms start at $120 per night. Walking Iron Bed and Breakfast offers a peaceful and romantic getaway to picturesque farmland surrounded by trees. The five rooms have been beautifully arranged and elegantly decorated in an airy Victorian style. The rooms feature private baths, some of which have relaxing whirlpool tubs, and rooms are also equipped with a television and DVD player, wireless Internet, and other necessary amenities. Take a soothing trip to the spa, which features a four-person sauna and sixty or ninety minute massages. There is a hammock near the river that is perfect for lounging, and guests are free to grab a book from the library whenever they want. Take advantage of the continental breakfast, which is served Monday through Thursday mornings in the dining room. A full breakfast is served on Friday to Sunday mornings, and you can even have your meal delivered to your room. Rooms start at $125 per night. Hanson House Bed and Breakfast offers a unique vacation experience in an eco-friendly environment. All four rooms have a touch of elegance, and the décor is lovely. The rooms feature wireless Internet, a refrigerator with complimentary soft drinks, an electric fireplace, and cable TV. Spend time in either of the two hospitality areas, which feature HD TV with local channels, a microwave in the second floor area, and free Wi-Fi. The property takes pride in its beautiful gardens, which are perfect for taking an afternoon stroll. Hanson House also has a spacious porch and an inviting parlor room. Breakfast is served in the rooms, and the dining room or the front porch is available for use upon request. The menu for the full weekend breakfast includes fresh fruit, muffins, chicken sausage, and broccoli cheese tarts. Rooms start at $125 per night. Allyn Mansion Bed and Breakfast is a Victorian style mansion with an elegant and intimate atmosphere perfect for couples. There are ten bedrooms available, complete with satellite TV, free Wi-Fi, and a refrigerator stocked with complimentary beverages. Guests receive a complimentary 30 minutes massage with every stay. Other spa services include Swedish body, hot stone, deep tissue, and pre-natal massages. The bed and breakfast offers the unique experience of dining in the tower, where you can breathe in the fresh air and admire the remarkable view. Breakfast is served daily and includes freshly pressed juice, fresh fruit, homemade granola, pancakes, sausage and eggs. Rooms start at $135 per night. Oaklawn Inn is a peaceful and beautiful oasis with four spacious guest rooms, complete with air conditioning, private baths, laptop desks, and free Wi-Fi. Guests can spend their downtime in the inviting common room, which features a fireplace and plenty of seating options. Alternatively, spend some time outside in the garden, which has a lovely pond and is a great place to appreciate the surrounding nature. A full, hot breakfast is served daily, and the menu varies from day to day. Some of the options include muffins, scones, scrambled eggs, French toast, fresh fruit, tea, and coffee. Rooms start at $134 per night. 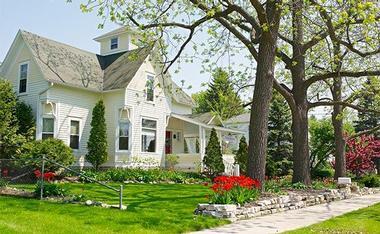 The Lawson House Bed and Breakfast is a prairie style bungalow with a quaint and compelling atmosphere. There are three unique and spacious rooms, each of which includes air conditioning, private baths, televisions, and wireless Internet. Guests will enjoy spending time in the large common room, which offers its own amenities. You’ll appreciate satellite television, card and board games, comfortable seating for reading or playing games, and a warm fireplace. Guests can always make a quick snack in the kitchen and they are also welcome to relax on any one of the patios. A continental breakfast is available on weekdays and a full breakfast is served on the weekends. Coffee and tea are also available in the morning. Rooms start at $95 per night. John and Deb's Place offers its guests comfortable lodgings with the allure of history. The inn has certainly preserved some of the rustic charm, but the two rooms are spacious with high ceilings and have all the latest comforts. The bathrooms are decorated with marble floors and all of them have Jacuzzi tubs, while the rooms are equipped with Keurig coffee machines and wireless Internet. You can really take the time to focus on your wellbeing here. Thirty minute and hour-and-a-half massages are available, along with aromatherapy, and Swedish massage services. Guests are welcome to enjoy all the common areas, and a few places only allow adults, ensuring comfort and relaxation for everyone. The hybrid hotel and bed and breakfast is located in town, and is only a short distance from shopping, entertainment, and dining. Rooms start at $129 per night. Lose yourself in art and culture in Wisconsin’s capital, Madison. Admire the work of artists like Frida Kahlo, Diego Rivera and John Steuart Curry at the 50,000 square foot Madison Museum of Contemporary Art. Discover Wisconsin’s history, and American history in general, with over 110,000 historical objects and 400,000 artifacts at the Wisconsin Historical Museum. View modern and contemporary art by European artists like Joan Miro, Eugène Boudin and Thomas Gainsborough or American artists like Shusaku Arakawa and John Curry at the Chazen Museum of Art. For budding archeologists and lovers of natural history, a trip to the University of Wisconsin Geology Museum will be a sure hit. Madison’s gorgeous fauna and flora is best enjoyed along the 1,200 miles of the Ice Age National Scenic Trail while learning about the state’s glacial history. The Horticultural Department of the University of Wisconsin also boasts a stunning garden and outdoor classroom for students at the Allen Centennial Garden. Other breathtaking gardens in town include the Madison Arboretum, home to the oldest and most diverse collection of restored ecological communities in the world, and the Olbrich Botanical Gardens which features an indoor tropical observatory within a 50 foot high glass pyramid. Make sure to stop by the Wisconsin State Capitol and be awed by its architectural beauty and design features. Full of trendy restaurants, cafes and shops, Milwaukee is a great destination for a quick weekend trip. Pick up enjoyable tidbits about the city’s history along the signboards of the Milwaukee RiverWalk, a two mile river-side trail with displays of public art. Better yet, travel back in time to the 1860s through to the 1930s at Brady Street, Milwaukee’s most ethnically diverse community, or shop and stroll through the Historic Third Ward in the downtown area. To explore the astronomical wonders of outer space, head to the Manfred Olson Planetarium and take advantage of their public telescopes. A trip to Discovery World promises a look into bizarre facts about the human body, insider information on what makes robots tick, and other scientific breakthroughs. At the Mitchell Park Horticultural Conservatory, visitors can enter several domes and experience tropical or desert environments among others. On a similar note, the desert dome has the world’s largest collection of cacti and desert plant life. Notable museums in the city include the Milwaukee Public Museum, opened in 1884 and home to the first IMAX theater in Wisconsin, and the Grohmann Museum which contains paintings and sculptures dating back to 1590 and originally collected by Eckhart Grohmann. Snuggled at the mouth of the Fox River, which flows into the Green Bay on Lake Michigan, Green Bay is the oldest community in Wisconsin, originally a French fur-trading center and today a quintessential charming small town best known as the home of Green Bay Packers. Even if you are not a football fan, you will enjoy visiting the fascinating Green Bay Packers Hall of Fame and taking a tour of their home stadium Lambeau Field. Kids will love 16 rides at the Bay Beach Amusement Park. Visit 1837 Hazelwood Historic House, a Greek-Revival home filled with original furniture and art. Learn about the history of the area at the Heritage Hill State Historical Park with 25 historic buildings built between 1672 and 1905. The Oneida Nation Museum tells the story of this Native American tribe’s history and culture. Wisconsin Dells is all about water. The beautiful Wisconsin River cuts the city in half and continues its rapid flow through spectacular canyons carved out of sandstone by glaciers tens of thousands of years ago. Named the Waterpark Capital of the World, Wisconsin Dells offers endless fun on the water, indoors and outdoors, and in adrenaline-pumping parks such as Mt. Olympus Water and Theme Park and Noah's Ark Water Park. If you crave some peace on your romantic getaway in Wisconsin, take a stroll through one of many trails at the Mirror Lake State Park or the lovely shady forested nature reserve around tranquil Mirror Lake. Stroll through the charming city’s downtown with unique shops and restaurants. Visit quirky Ripley's Believe It or Not! Museum and take the kids to the Tommy Bartlett Exploratory - Interactive Science Center where learning and fun go hand in hand. A resort town since late 19th century and as beautiful as its namesake in Switzerland, Lake Geneva has since then become the playground of the rich of Chicago and Milwaukee, whose citizens built lavish mansions and villas on the hills along the glimmering lake. Some of those mansions (such as Black Point or Stone Manor) are open to the public today. You can see many of them perched on the edge of the lake from a boat on a tour with the Lake Geneva Cruise Line. Visit Old World Wisconsin, an interactive museum of Lake Geneva and Wisconsin that will make you feel like you’re travelling through time as guides in period costumes depict the ways of life of the early settlers. Take a tour of the Yerkes Observatory, the birthplace of contemporary astrophysics. Take a hot air balloon ride for a magnificent view of the city and the lake, or stroll along the lake and enjoy its tranquil beauty. If you ask two Wisconsin fishermen about the best fishing lake, they will probably disagree. But, one fact stands: Devils Lake is a true sportsman’s fishing lake – no big boats with outboard motors allowed at this place of exceptional natural beauty. This magnificent body of water in Sauk Country in the Baraboo Range is surrounded by ancient hardwood forests, rocky hills, and 500-feet high quartzite bluffs, and it is part of the Devils Lake Park with numerous hiking trails, campgrounds, and marinas. But, most people come for the fish. Take your canoe, kayak, or even fishing tube, throw your bait, and wait for the fish to jump. Fair depth, clear water, a few rock structures, and healthy green weeds make the lake an angler’s heaven. If you are lucky, you will find brown trout, northern pike, walleye, largemouth bass, smallmouth bass, bluegills, and crappies. Spread along the banks of the Mississippi River where the Black and La Crosse Rivers join it and overshadowed by the 570-feet tall Grandad Bluff, La Crosse is a city of breathtaking natural beauty. You can still see old steam paddle wheel boats plying the river waters with their cargo of curious tourists. Stroll along Riverside Park and enjoy a beautiful view of the timeless river and find a spot to relax and unwind. The park on the Grandad Bluff offers views of three states: Minnesota, Wisconsin, and Iowa. The charming downtown area is full of unique little shops and elegant architecture. Check the Historic Old Gantert Building with a huge antiques store. See a movie at the beautiful historic Rivoli Theatre, or catch a play at the renowned Weber Center for the Performing Arts. Bayfield, a small port town on Lake Superior, is a former commercial fishing and lumber town that today is completely dedicated to making sure tourists have as much fun as possible. It is a gateway to the beautiful Apostle Islands National Lakeshore, which includes a spectacular formation on the mainland and a group of 21 mainly unpopulated islands, meaning visitors to Bayfield can enjoy excellent hiking, bird-watching, old lighthouses, exciting sea caves, terrific sailing, hiking, kayaking, and scuba diving. The Madeline Island Ferry connects Bayfield with Madeline Island, the largest of the 21. Bayfield has rich history, and the best places to learn more about the city’s past and heritage are the Bayfield Heritage Museum and Bayfield Maritime Museum. During the summer, Big Top Chautauqua, a large tent theater, hosts popular shows and concerts. On the rugged shore of Lake Superior in the northernmost part of Wisconsin, Apostle Islands National Lakeshore includes 12 miles of coast edged with sandstone cliffs, deserted beaches, and 21 jewel-like islands with nine historic lighthouse towers on six islands and 240 species of birds that live, breed, or pass through the archipelago. Clear water, spectacular underwater caves, and shipwrecks offer great scuba diving in spite of cold water. There are about 50 miles of hiking trails in the park and about five miles on the mainland starting at Meyers Beach. The trails on the islands lead to historic lighthouses, old farm sites, abandoned fishing camps, sandy beaches, campsites, and fantastic views. Located at 1,719 feet (the highest point in southern Wisconsin) near the village of Blue Mounds, the Blue Mound State Park has some unique amenities. The swimming pool, the only one in a Wisconsin park, operates in the summer. Miles of hiking and biking trails are available in the summer and while snowshoeing and cross-country skiing are available in the winter. You can also find an interpretative nature center, the picnic area, shelters, and campgrounds. Two tall wooden observation towers offer miles of unobstructed views of the Baraboo Range and the Wisconsin River. The park is very popular for mountain biking and serves as the finish line to the popular Horribly Hilly Hundreds bicycle race. Plymouth is a small city on the banks of the Mullet River in Sheboygan County in the green rolling hills of the Kettle Moraine only one hour from Milwaukee. Plymouth is proud of its 25 fascinating murals painted by the notorious Walldogs and a 20-foot tall cow called Antoinette, the local landmark and a symbol of the area’s thriving dairy industry. The city’s downtown, which revolves around the lively Historic Mill Street, is lined with elegant, well-preserved buildings, quaint boutiques, antique stores, and good restaurants. Among the beautiful historic downtown buildings are Plymouth Arts Center and Plymouth Historic Society Museum. Old Plank Road Trail offers exceptional hiking to the city surroundings. Located on the sandy shores of Lake Michigan at the wide mouth of the Sheboygan River and about 50 miles from Milwaukee, Sheboygan is an interesting, culturally diverse, friendly city where everyone can find something of interest. There is boating and surfing on the lake, fun in the sand on the beaches for the kids, fantastic golfing, and several excellent trails for hikers. The lively cultural life revolves around the John Michael Kohler Arts Center with its renowned collections of folk art and the 1920’s Stefanie Weill Center for the Performing Arts. The city’s many festivals range from German-style Johnsonville Brat Days offering bratwursts in all shapes and forms and the traditional Hmong New Year celebration with the colorful costumes and traditions of this newly arrived Asian ethnic group. Harrington Beach State Park is a forested park located on the scenic coast of Lake Michigan not far from the village of Belgium. One of the nicest sandy beaches on Lake Michigan is dotted with picnic and camping areas. A popular picnic area can also be found on the coast of the scenic Puckett’s Pond, the site of the former quarry. Swimming in the lake is wonderful for cooling off in the summer. There are seven miles of lovely, shady hiking trails through the forested park and one mile along the lake, where hikers can see remnants of an old pier. Another curiosity is the anchor of the unfortunate freighter Niagara, which burned in 1856 just off the lakeshore. Scuba divers can explore the freighter’s remains at a depth of 80 feet only a few hundred yards from the shore. Fishing for trout and salmon in the lake and Puckett Pond is another very popular activity. From one of the busiest lumber cities in the 1800s, a home of Woodland Indians culture, and a thriving agricultural center, Eau Claire grew into a charming town on the banks of two rivers (the Chippewa and Eau Claire) with a rich cultural life and great green spaces for outdoor activities. The Chippewa Valley Museum is a fascinating place to explore the history of Eau Claire and Chippewa Valley. The museum is located in Eau Claire’s magnificent 134-acre Carson Park on a peninsula on a Half Moon Lake. Kids will love the Action City Family Fun Center with over 100 redemption and video games and the Children's Museum of Eau Claire with five exciting hands-on exhibits that make learning as much fun as playing. Sturgeon Bay is a historic small port town in Green Bay, Lake Michigan, a major regional shipping hub with history that dates back to 1835. The picturesque marina is home to hundreds of small and big boats, and the iconic Michigan Street Bridge, also called Steel Bridge, dominates the city skyline. 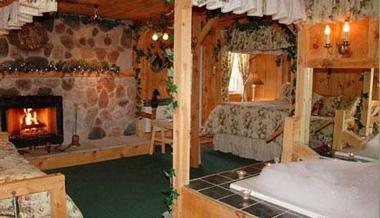 If you are looking for romantic getaways in Wisconsin, this is a beautiful spot. Door County Maritime Museum has four large galleries and a restored 1919 tugboat John Purves. Learn more about the city’s past at the Door County Historical Museum. Take a nice hike along the water at the Cave Point County Park. Ride an old Chicago fireboat and take a tour of the lake to see the city and its fascinating lighthouses from the water. Kenosha is small waterfront town on Lake Michigan not far from the Illinois border. The heart of the city is its beautiful lakefront Harbor Park with quaint shops, restaurants, museums and galleries, and its quaint historic downtown. Vintage electric streetcars take visitors through the city connecting its most interesting spots, most of them along the lakefront. The Kenosha Public Museum, a fine art and a natural science museum, has more than 80,000 exhibits, about 1000 of them fine art pieces. The Dinosaur Discovery Museum is located in a beautiful 1908 Beaux Arts city landmark, and it explores the link between today’s birds and meat-eating dinosaurs. Book a fishing charter to try your angling skills on the Michigan Lake fish, or go sailing with the Tall Ship Red Witch. The Swiss Village Historical Museum tells the story of the new immigrants’ early days. Don’t miss the tour of the New Glarus Brewing Company. Take a hike or a picnic at the lovely shady New Glarus Woods State Park. 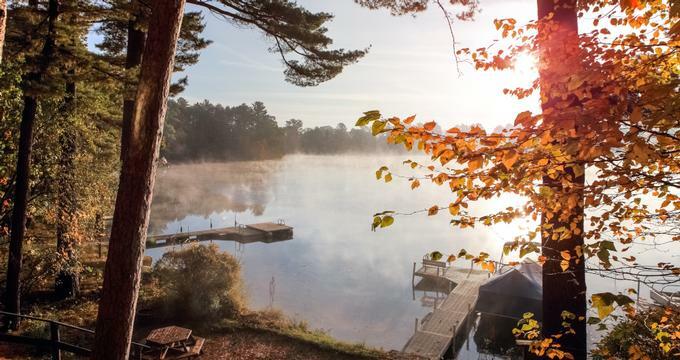 Called the “Island City,” Minocqua is surrounded by lakes and Wisconsin’s ancient north woods, and it is only a few hours from Minneapolis-St. Paul International Airport. Minocqua has small town charm and world-class outdoor activity options. Hailed as the snowmobile capital of the world, Minocqua attracts snowmobilers with its many trails through dense woods. Water sports during the summer and ice fishing and cross-country skiing attract thousands of tourists every year. A great time to come for a visit is during winter Cruiserfest with its snowmobile demos, cruise radar runs, and much more. Minocqua has an active cultural life as well. Check out what is happening at the Campanile Center for the Arts or the Lakeland Performing Arts Association. Learn more about the Ojibwe art and culture at the George W. Brown Jr. Museum and Cultural Center or enjoy one of their Summer Traditional Native American pow wows at Indian Bowl on Long Interlaken Lake. 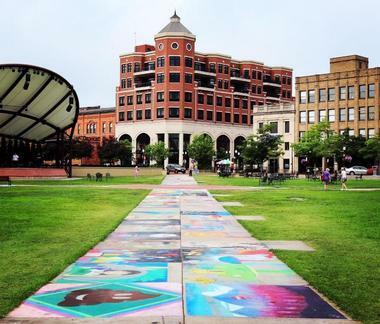 Wausau is small town split in half by Wisconsin River with a quaint historic downtown where you can shop on the Third Street pedestrian mall or relax at the public square where there is music in the summer and ice-skating in the winter. The Marathon County Historical Museum tells the story of the city’s past, and the elegant Warren Historic District and River District are beautifully renovated reminders of human endeavors. There is always something going on at the Grand Theater. The Leigh Yawkey Woodson Art Museum showcases the best local and regional artists. The city is surrounded by spectacular natural beauty that offers opportunities for great whitewater kayaking or canoeing, hiking, and skiing.